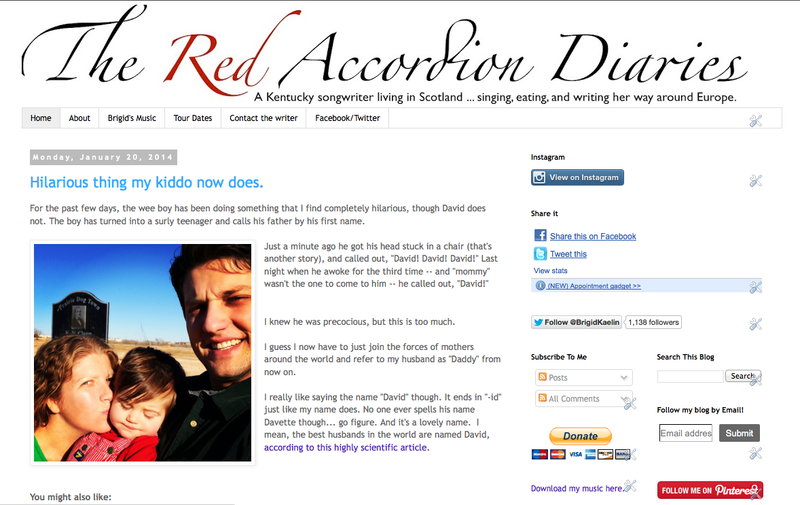 The Red Accordion Diaries: 1000th Blog Post! It's my 1000th blog post! Yes, you read that right. One thousand. All this blogging nonsense began in 2006 when I was one of fifty people in the country singing in the semi-finals of the 4th season of Nashville Star. Starting a MySpace blog seemed the easiest way of keeping people informed of the crazy goings-on of reality television. MySpace, I tell you! How's that for old-school? Who knew that over the years, I'd be sharing news of world tours, a wedding, international moves, childbirth, and my deepest darkest secrets? Even crazier, who knew that anyone out there would be reading it? But there you are, and I thank you much for sticking by me, even though I'm not doing so much traveling, singing, or cooking anymore. Like this blog? Follow The Red Accordion Diaries on Bloglovin'.